Every Sunday is special, it is a privilege to come together in corporate worship to our loving God. Yet we would all agree that some Sunday’s do seem more special than others. You know, those Sundays when we feel more of God’s presence than at other times. Well we recently enjoyed one of those Sundays. I woke up early, anxious and concerned about the message I had prepared and the nerves followed me into the pulpit. I repeatedly lost my place in my notes and regularly got my “mords wuddled”. Yet to my surprise, after the service many people came to me encouraged, they felt that the word given was just for them. In my weakness the Lord had clearly intervened. 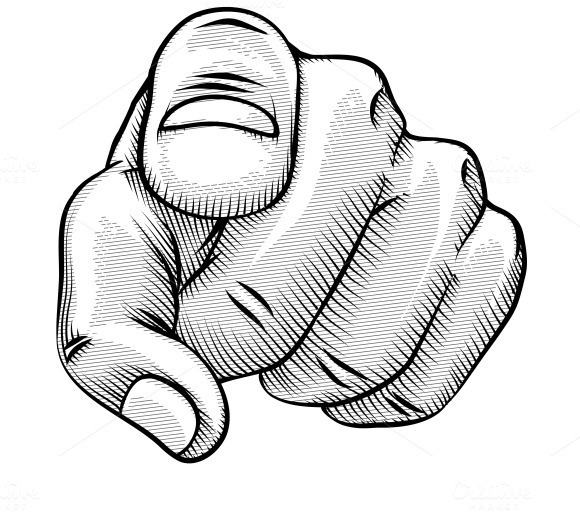 I know relatively little of the lives of those I am preaching to (only what they want me to know), and admit to knowing even less of their thoughts at the time of preaching, I am not a mind reader. Yet the word the Lord gave me spoke to them in their own individual situations. Praise Him. We have all experienced such a time as Christians. Whether in church, through our private meditations on God’s Word or in Prayer. Times when God speaks directly to us and to our situation. We receive words of joy and encouragement as well as loving discipline. Psalm 130 (below) speaks of such a time when the Word of God slices straight through to our hearts and we feel such deep conviction of our failures before Him . Times when our consciences begin to work in overdrive as we are reminded of historic wrong doing, our past failures. They may have occurred long before we gave our lives to Jesus, but the Lord brings them back to us for repentance. Or there maybe incidences of backsliding during our walk with God that we felt were quite acceptable at a time of naivety. But as we have grown in Christ, through the sanctification of God the Holy Spirit, we look back under greater conviction and we can’t believe how wrong we once were. Or we could be under the realisation that we are currently living in sin and that we must stop and seek God’s forgiveness in Christ. As the preacher continues to speak, we feel as if we are the only one in the church, his words cut deeper and deeper and we sink lower and lower into the pew as the ever growing realisation of our sin attacks us. We begin to anxiously list our failures before God. I feel the same as I approach the Pulpit each week, the weight of the message I have carried speaks as much to me as to the congregation. I am constantly reminded in my walk with God of my failures, my weaknesses and how undeserving I am of the privilege to serve God and His people. Being in ministry is such a battle, one I was never prepared for, it is not like any other job, it is an emotional roller-coaster of fear, anxiety and unworthiness. I often think if only the flock knew of my failures, if my past was written on the walls of the chapel for everyone to see, I could not stand. The church would be empty and I would be the first to leave under a cloak of my own shame. Such conviction from God is hard to deal with, it is exhausting, it burns us like a refiners fire (Malachi 3:3). Under the weight of our own consciences we judge ourselves condemned and we fear the greater condemnation to come by the eternal and perfect Judge when we meet Him on the last day. The emotion becomes overwhelming as if we are drowning, sinking in guilt and fear. We cry out of the depths of our sin. We see no hope, no way out, we just want to run and hide, we want to cover ourselves as Adam and Eve did in the garden. But then we read Verse 4 of this most amazing and precious Psalm! One of the amazing “but’s” in scripture! The Holy Spirit brings us to a point of despair so we can do nothing but rely on God. He drags us to the depths of grief so we can strike an abundant well of His Love and Grace. These emotional trials we face and are going through are an act of the greatest love, because with God there is forgiveness. To truly understand how amazing and all-encompassing God’s Grace is to us sinners, we need to understand the depth of our own wretchedness. This can takes time as we grow and wait on the Lord, the Psalmist emphasises the ‘waiting’ by repeating this statement in the poetry of the text (verse 5-6) my soul waits for the Lord more than watchmen for the morning. The Lord uses this time of waiting to challenge us, to refine us into silver, to become a Holy people, prepared and ready for Heaven. As we grow, so does the realisation of the sins that we took so lightly in the past, and we see that by our partaking of them also took our Saviour lightly. Our Saviour who left Heaven to suffer so. The closer we come to God, the more we walk into the light of His Glorious perfection and the more we then see of our imperfections. The more we mature as Christians, the greater our knowledge of God grows, the deeper His Word then cuts into our souls and the greater our need of Him becomes. As Christians we battle with grief and fear, but this not a servile fear, it is a filial fear, a good fear, a fear that leads to willing obedience, a loving fear that a Son has for His Father, a fear that brings us to the Lord in faith, a fear that gives us blessed assurance of sins forgiven. Forgiveness found only in Christ Jesus, the Hope of Israel, who took our sins on the Cross and took God’s just wrath that we deserve. The Psalmist tells us in verse 8 that He has redeemed us from all iniquities. I repeat from all iniquities! Not just the small sins, but the big ones to! If we repent and have faith in Christ there is steadfast love, and with him is plentiful redemption. What amazing Grace! Even the chief of sinners can be saved! If we call on Jesus we receive plentiful redemption! Hallelujah! What better news is there? The next time you feel that the preacher is talking just to you, at these times of great conviction, remember that God’s Son left the perfection of heaven to die in the most unimaginable pain, remember that He hung on a cursed tree, naked, beaten and left to die as a criminal, rejected by His people and His Father. Then ask yourself what possible sin could you have committed that falls below the depths of what Christ went through on that day, to raise you up from it? Rejoice that it is by His Love, His Grace and His works that your salvation is secured! When Satan reminds you of your past, remind Him of His future, remind Him that Christ was victorious on the cross and lives today sat at the right hand of the Father, you have been washed clean, Jesus has redeem you from all your iniquities. This is the Grace of God, the light in the darkness of our hearts, the good news of the Gospel! Wait on the Lord because in Him there is Forgiveness and he will redeem Israel from all his iniquities. O Lord, hear my voice! Let your ears be attentive to the voice of my pleas for mercy! O Israel, hope in the Lord! For with the Lord there is steadfast love, and with him is plentiful redemption. I have had the privilege of spending this week in Victoria Village Primary School, running a Bible exhibition for the children on the Life of Jesus, with the Open Air Mission (OAM). The Exhibition comprises of 17 boards that start with the prophecies of Christ found in the Old Testament and then continue to depict their fulfilment in the person of Jesus, through His birth, miracles, teaching, death on the Cross, Resurrection and pending return. The pupils came into the hall for around an hour per class. They then sat in the middle of the exhibition, polishing the floors as they shuffled to each board under the narration of friend and partner in the Gospel, JP Earnest (who came all the way down from Anglesey to deliver the exhibition for the Children). As the children journeyed through the boards they were met with characters from Jesus’ life who then gave their testimony. I had great fun dressed up as the Roman Centurion, going into the gruesome details of the crucifixion with the children. They really got a sense of the suffering our Lord left Heaven for. However, I must stress we were not acting. We were giving testimonies from the truth known in Scripture and worked very hard not to embellish on the historic facts. I also enjoyed being “Pastorix Johnicus,” marching around the school to the children’s great pleasure, winding them and their teachers up. One child commented on my standard issue “iPhonicus VI” in my hand – the piece of tech was a great distraction from the star wars socks I was wearing (yes, with sandals). 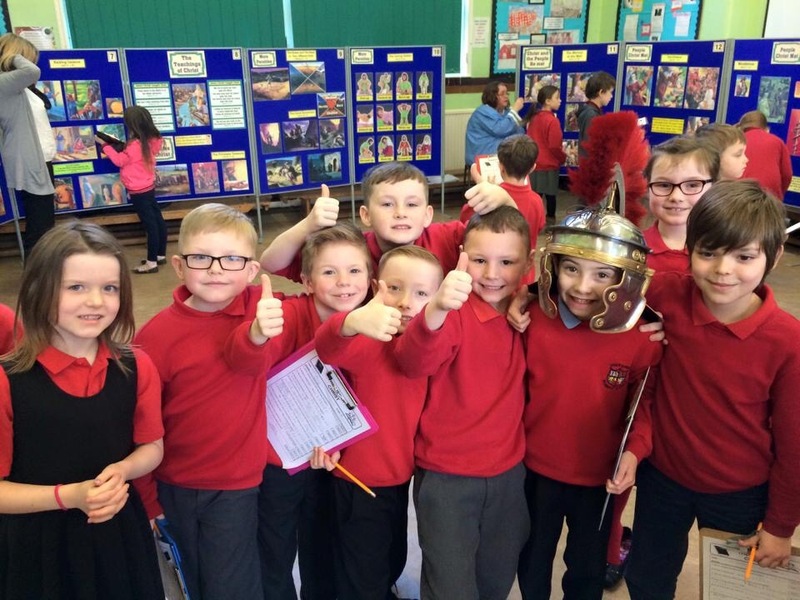 The older Children (Key Stage 2) enjoyed a fun quiz at the end, where they went around the exhibition with clipboards to find the answers and meet the characters in person. The quiz was collected in at the end and the children all left knowing more about Jesus Christ and the scriptures that have held the test of time. We ended the exhibition with a school assembly. 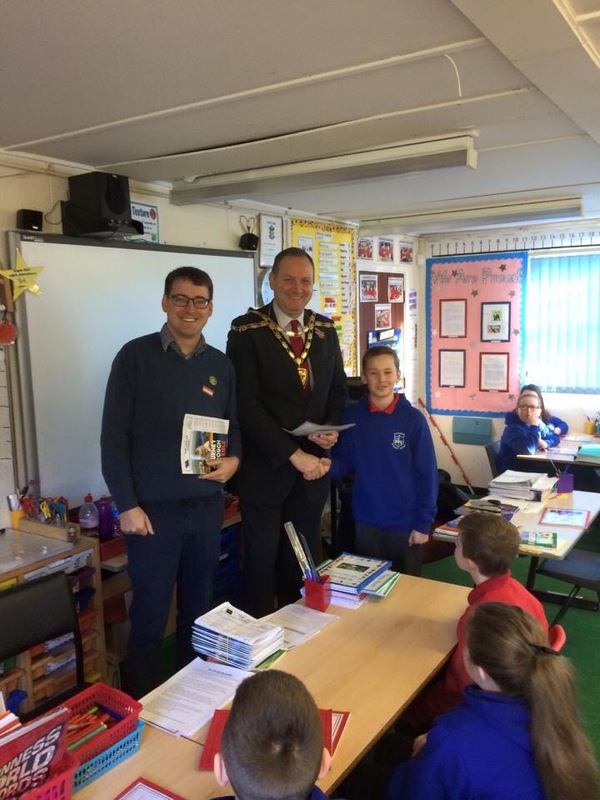 I invited Mayor Giles Davies to give out the prizes for the best quiz answers. He jumped at the chance to help his local school! The children were then all sent home with a folder (courtesy of OAM) which included; their marked quiz papers, word search, a personal letter of introduction, a poster advertising our youth ministry and a flyer promoting our Valentines Family Friendly Service, this Sunday 5pm at Noddfa Chapel (all are welcome). The Exhibition was a real pleasure, not only because we had the opportunity to share the Gospel with 220+ pupils (as well as the teachers and staff), but also for the insight I gained into how this most wonderful school ticks. The teachers are fantastic and have a genuine love for each Child. Miss Dando (Headteacher) knows every child by name and would often receive a big hug on meeting them, or would be in receipt of a friendly update on their lives. The children were all polite, well mannered, disciplined yet also given the freedom to explore and learn. The environment was one of peace, safety, fun and learning. Tuesday was an emotional day for all in our community. Teachers, staff, parents and pupils were all distraught when news broke about the pending closure of our beloved school. Yet in this darkness, by God’s Grace and providence, we were able to bring light through the exhibition, to share the Good News of Jesus Christ and give the children something to take their minds off the closure of their school. The children were shocked to hear of Jesus’ death, they could not understand why a man who did no wrong, who helped the poor and sick, would be treated in such a way. But this is how God often works. It is in such weakness that He defeats the strong for His Glory. By God’s Grace Moses took on Pharaoh, David beat Goliath and when God’s Son was nailed to a cross breathing His last, He beat the curse of death and reunited the lowest of the low (like me) to their loving God. In Christ’s weakness and death, by God’s Grace, I now have eternal life (2 Timothy 1:10). The Bible repeatedly tells us that we live in a fallen world, opposed to God and driven by Sin (Ephesians 6:10-12), so bad things can and do happen. Yet in such darkness God gives us light (John 1:5), in such weakness God gives us strength (2 Corinthians 12:9) and in trials He comforts us (2 Corinthians 1:4). I pray that God will work in our weakness as we share the Gospel in our community, for His Glory! A big thanks to all those that volunteered. I woke up early on Christmas day morning, rushed down the stairs with my very excited children and we began to dish out the presents. Amidst the chaos of torn wrapping paper I was handed a card by my most amazing wife. I opened the card and inside were the booking details for a weekend away to one of my favorite cities, Edinburgh! Result! As a child Scotland was our annual family holiday destination. My father was a keen golfer so we would spend our time in St.Andrews and would often make the short trip south to Edinburgh. I have some very fond memories of the city. Each year I still watch the military tattoo at Edinburgh Castle on the TV and I must have been reminiscing, so my wife kindly booked the surprise trip for me. I was delighted! One of the best things about receiving a gift is the anticipation. I had been guessing (unsuccessfully) for weeks beforehand (and enjoying every moment), now in receipt of the gift I had another four weeks of excitement ahead of me whilst awaiting for our departure. I began to plan our itinerary! A romantic weekend was simply out of the question, no time. I love learning about the Napoleonic war and of course church history. Edinburgh is one of the best places in the world for both! My wife was pleased! With the children safely at my sister-in-laws we flew into Edinburgh to begin our long weekend. Hurricane Gertrude was hitting the city as we were landing, the pilot admitted afterwards that we had narrowly escaped being blown off the runway. It was a scary ride. We dropped our bags off at our hotel and went straight to the castle where I was blown away by the Royal Dragoon Guards museum. I saw the golden eagle taken by Ensign Ewart at the Battle of Waterloo 201 years ago, amazing! (That evening we toasted his triumph with a nice single malt at his pub down the road). We also visited the national galleries, Princess street, the Royal Mile and Sr. Mary’s close. Saturday was church history day where we spent our time living in the steps of the great reformer John Knox. John Knox (1513-1572) was a leader of the European Protestant Reformation and was educated at the University of St Andrews. His early “career” as a reformer of the Scottish church saw him under siege by the state at St.Andrews, where he was then taken prisoner by the French and forced to row the galley ships as a slave. On one occasion his vessel returned to the Scottish coast to scout for English ships. Whilst in chains, a slave and suffering ill health on the open water, Knox saw the steeple of St.Andrews church and vowed to return to preach there again. By God’s Grace he did. In 1549 Knox was released from slavery to exile in England where he was licensed to work in the Church of England. Knox rose through the ranks to serve King Edward VI of England as a royal chaplain and thus had a ‘reforming’ influence on the text of the new CoE Book of Common Prayer. Knox then resigned his position when Mary Tudor ascended to the throne and re-established Roman Catholicism. Knox bravely went head to head with the Monarch during her reign, owing to her support for Catholic practices. In fear of his life Knox moved to Geneva and then to Frankfurt. In Geneva he met John Calvin, from whom he gained experience and knowledge of Reformed theology. Knox return to Scotland and risked life and limb to lead the successful Protestant Reformation of Scotland that ousted Mary of Guise (ruler of Scotland and mother of Mary, Queen of Scots). Knox was a great preacher, “he was able in one hour to put more life in us than five hundred trumpets continually blasting in our ear.” It has been said that Luther was the reformations hammer, Calvin the pen and Knox the trumpet. Knox wrote a new confession of faith and ecclesiastical order for the now reformed church of Scotland (the Kirk) and served as Minister at St.Giles (Edinburgh) until his death in 1572. At his burial the regent of Scotland said “Here lies one who never feared any flesh“, a fitting testament to the man. The great reformers place of rest is now a car park (no.23), which is rather fitting for a man who worked tirelessly to rid the church of its unbiblical pomp, wealth and corruption. He would not have been pleased with a grand tomb. It was great to enjoy Edinburgh’s architecture and history once more, especially now as a Christian, I could truly appreciate its significance in our churches history and the freedoms we know share in worship. On the Sunday morning we shared such freedom of worship with St. Columba’s church, who gave us a warm welcome. A church that only 14 years ago had just 12 members and now you God’s Grace welcomes 180. I pray we can experience the same blessing in our little Welsh Valley. For those concerned for my wife, we did split the weekend long history lesson with some lovely meals out and romantic evening walks (urban hikers), where she got lots of love and attention. – the least I could do for what was an amazing weekend.